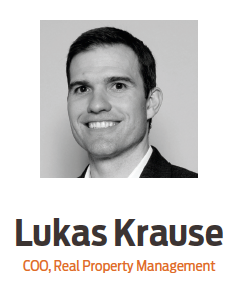 Lukas Krause, Chief Operating Officer (COO) of Property Management Business Solutions LLC (parent company of Real Property Management), has been named among HousingWire Magazine’s 2015 Rising Stars. The HousingWire Rising Star program acknowledges the top 40 industry professionals under the age of 40 who have driven their organization and their respective industry forward through their notable accomplishments. HousingWire describes this year’s winners as risk takers who act as change agents within their companies through their involvement in systems, processes or products. As COO, Krause leads our network of franchised locations that manage over $7 billion in assets. He has made monumental changes to the franchise organization, including implementing a new system of operating software, adding new departments to assist franchisees, and developing new operations and procedural manuals. Through his leadership, Krause has helped Real Property Management grow from 164 offices to over 260. Congratulations to Lukas on this recognition! Rest assured that your property is being managed by the nationwide leader, with solid leadership and integrity from Lukas Krause and the rest of the Real Property Management team.